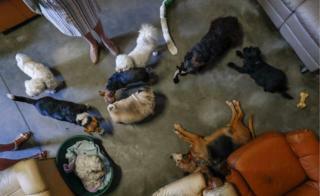 In southern Belgium there is a care home that accommodates 150 aging animals, living out their final days in peace. The home is run by Valerie Luycx, below, and is called Les Petits Vieux (The Little Old Ones). 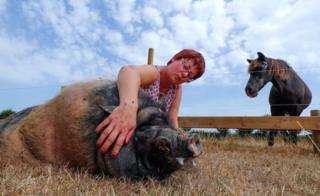 The animal shelter, located in rural Chievres in the province of Hainaut in the south of Belgium, is home to Pastis the pot-bellie d pig, below, along with a number of elderly cats, dogs, ponies and goats, photographed here by Yves Herman from Reuters. 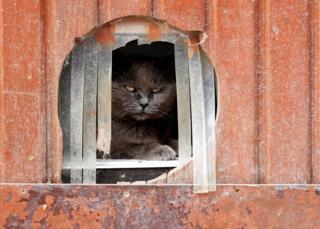 All the animals either have health problems or have been given up because their owners were too old to care for them. 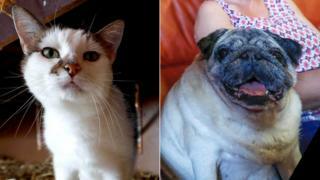 Residents include Azuria, a 15-year-old European cat (below left), and Ramses, a nine-year-old Carlin dog. There is also Calin the cat, who may not be a fan of being photographed. 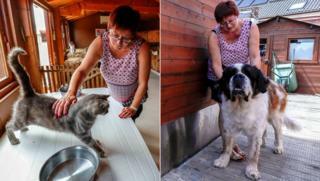 Calin is seen below enjoying being stroked, whilst Yam the nine-year-old Saint Bernard dog poses for a portrait. 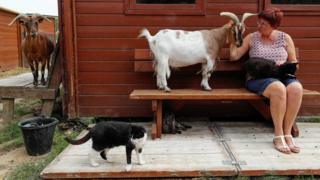 Valerie founded the shelter in 2000 with her husba nd Serge. 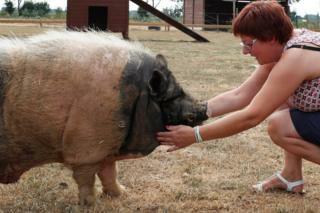 She said: "We wanted to recreate family life for the animals." On the left here is Choupy, a 14-year-old Yorkshire Terrier. 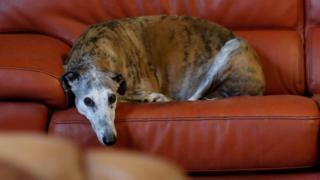 And here we have Caracol, a 10-year-old Spanish Galgo dog, or greyhound. The residents are allowed to play with each other and lounge quietly on sofas.